Guitarist/Composer/Educator, native of the Bay Area and has been an active member of the South Bay Guitar Society since 1993, where he has been a soloist, clinician and educator with outreach program The Guitar Story (2007-2015), the American Red Cross Katrina Relief Beneﬁt and the yearly SBGS Guitar Festival. ​From 2000-2005 he was a featured soloist for the Ka’ū Concert Society on the Big Island of Hawaii. In 2006 he released his ﬁrst recording, Roundtrip, a collection of new works, arrangements and compositions for solo guitar. 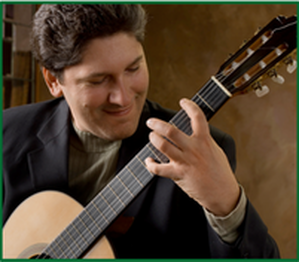 Benett teaches beginner through advanced guitar classes at Foothill and DeAnza Colleges and Intro to Electronic Music at DeAnza.